Grouping the lichenicolous lichens and fungi together for convenience. If you find a lichenicolous species, it will be added to the group if either of the tags "lichenicolous fungus" or "lichenicolous lichen" are used. Lichenicolous fungi are parasites that attack and often kill particular lichens. They are not the mycobiont (fungal associate) of the lichen - they are separate and many are specific to certain lichens. Both ascomycetes and basidiomycetes fall within this group, though it is sometimes only when the specimen is examined microscopically that one can tell the difference between the two. The common Xanthoria parietina is a good lichen to search for lichenicolous fungi - especially when growing on elder, I find. 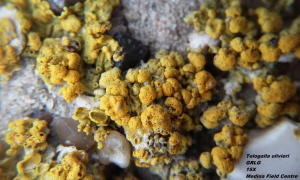 The commonest Xanthoria parasite is Xanthoriicola physciae, which appears as a black powder covering the apothecia and thallus (there are images of this in the gallery of this project). Other parasites of this species can be found (mainly) on the apothecia, forming blackish ascomata or pycnidia, sometimes causing reddish bruising or whitening of the surrounding area on the host. Lichenicolous lichens are lichens that are substrate-specific to other lichens, mostly crustose species from what I have read. They kill their hosts by eventually overgrowing them. Often lichens overgrow others but are not specific to growing just on them while a proper lichenicolous lichen grows chiefly on a lichen host. An example of this is seen by the behaviour of the lichen Lecanora sulphurea, which overgrows Tephromela atra on calcaereous substrates. The study of lichenicolous species is helped significantly by the use of a microscope, usually with oil immersion as spores and conidia are very tiny. I prepare my slides by dissecting off some fungal fruit bodies, or an infected piece of lichen, and then soaking them in a drop of KOH on the slide. The required amounts of both the KOH and fungus to be examined are miniscule. Water will do if KOH is not available, but it makes the process slightly harder if the sample is hard (KOH loosens fungal tissues). A cover slip can then be added to the slide and the sample should be squashed between the cover slip and slide by a non-metallic object like a glass rod or the plastic handle of a dissecting needle. I do this by tapping the sample with the object until the fungal filaments disperse and the fuit bodies (if there are any) of the lichenicolous fungus split open. Then, the slide will be ready to check under the microscope. The preparation only takes a couple of minutes. It is best when asci are found in ascomycetes as there are often interesting spores that fall onto lichens from elsewhere that may cause confusion. Sometimes the fruit bodies of a lichenicolous fungus have liberated all of their spores and one struggles to find any, which is rather annoying. Not all lichenicolous fungi are impossible to do in the field. Most common Xanthoria and Physcia parasites are recognisable by sight once they are known. It is best to check anything that looks unusual though. And, of course, the NBN atlas has some records of these things uploaded from the BLS. I hope this project comes in handy for some of you.